Pitcher Chris Karnbach was a big reason why Madison High School baseball enjoyed a tremendous season, exceeding exceptions by going 14-2 during the regular season. The Knights followed up the success by making it all the way to AAA semifinals, where the team lost, 3-2, to Staten Island powerhouse, Tottenville. Karnbach, a Mill Basin, Brooklyn native, recorded a 5-1 record with 1.35 ERA during the regular season. He continued to excel in the postseason, posting a 2-0 mark with a minuscule 0.47 ERA in 15 innings of work. Chris Karnbach at the NYC Mayor’s Cup at MCU Park on Coney Island in June. Come September, Karnbach will be crossing the Verrazano to attend the College of Staten Island to study physical therapy and play America’s past time for the Dolphins. While it’s obvious he loves the game, he’s already eyeing life after baseball. “Actually, it’s the academic program in physical therapy that they have there, but the coach (Michael Mauro) saw me here (MCU Park) at the senior showcase, and wanted me come down,” he explained of the main reason why he’s headed to CSI. 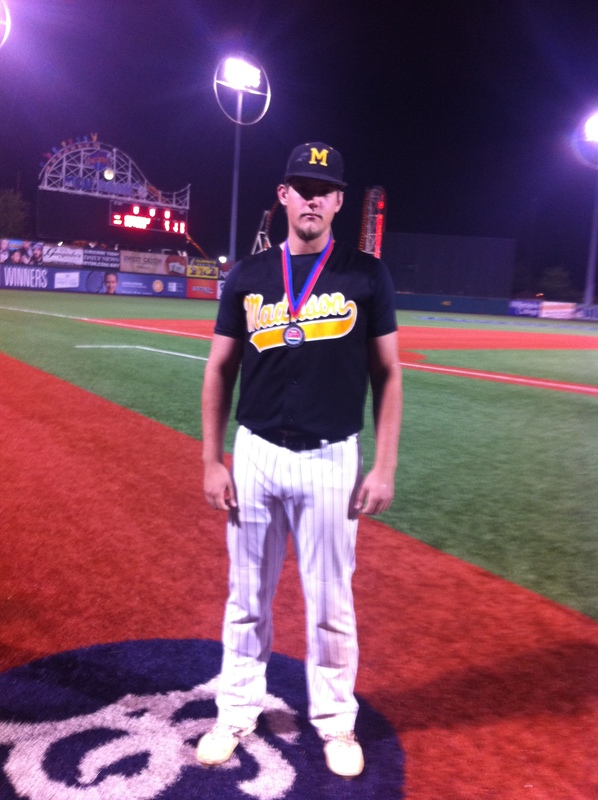 In June Karnbach displayed why he was a fierce high school pitching threat by starting and tossing two scoreless innings in the NYC Mayor’s Cup at MCU Park on Coney Island, which the CHSAA (Catholic High School Athletic Association) won, 7-2. The Gravesend resident believed it was his strong work ethic that helped him become a success in High School, while his young teammates followed suit, and went all out in order to prove the naysayers wrong. Karnbach said he played for multiple youth leagues on Long Island and in Brooklyn growing up, including Joe Torre, Bergen Beach, Amity and Good Shepard. Not playing in one particular league for a long time, it forced Karnbach to hit the diamond with a vengeance as the new kid on the block. When the college baseball season rolls around, Karnbach will get the opportunity to do it all over again—this time as a collegiate hurler determined to make his mark.